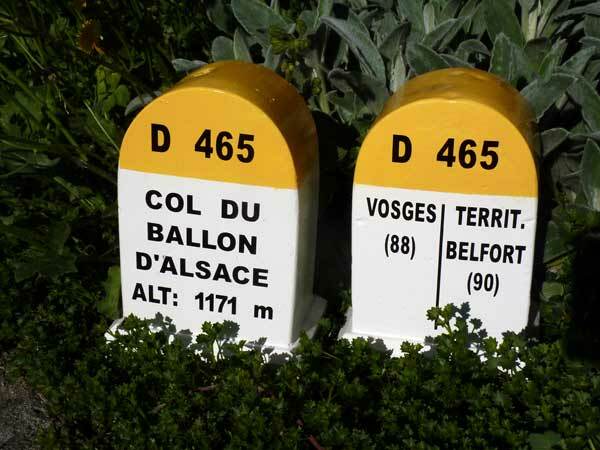 During my first ever trip to the Vosges, I got a little more ‘Stuffed Ballons d’Alsace’ than I was able to swallow. I anticipated ‘friendly’, green and quiet climbs, which is what most descriptions show/promise you. Don’t get me wrong: the scenery was very nice, although traffic was a little annoying at times. However, I really chocked on the more than frequent bits of 11, 12% average, with extra spicy chunks of 15, 16% which – as usual – are not visible in those nice profile pictures. Obviously, I may also have been a little overenthusiastic when I tried to fit in as many of the ‘known’ ballons into my only 3 days of cycling. And to make things worse, the weather was not very cooperative. I first rode in drizzling rain and near-uncomfortable temperatures of around 10 degrees Celsius on Monday afternoon and all through Tuesday, when all of a sudden the weather changed and Wednesday threw a blistering sun and 36 degrees Celsius at me. I figured that on Monday I might just as well drive past Colmar – where our apartment was located – on to Cernay, to the start of one of the climbs up the Grand Ballon (1,325m). This one is rated as the toughest in the region, mainly because of its length of 20.8 kilometers. With an altimeter gain of 1,033 meters, the average grade is a mere 5%, but that’s because there are two short – 1 kilometer – drops and a total of some 4 kilometers near flat. The steepest kilometer is 9.6%, the final 5 kilometers, after passing the summit of the Col Amic (825m), the average is 8.5% with several stretches of over 10%. I rode on towards Le Markstein (1,183m), Le Breitfirst (1,280m) and Col du Platzerwasel (1,183m), after which a flying descend towards Colmar ended on the motorway. I did ride the shoulder of that until Paula catched up with me and as I felt uncomfortable, I put the bike in the car. I figured out later that I should have taken the secondary road out of Munster towards Turckheim. Since I had set my mind on making a trip to the nearby Black Forest on Wednesday, figuring that after that Thursday would be an ‘easy’ day, I served the Vosges main dish on Tuesday. As I already experienced the previous day that the climbs here where not as easy as meets the eye, I was planning on a short break at every summit, to have something to eat and drink. The first climb would be the Petit Ballon (1,163m) from Wihr-au-Val, rated 5th overall and listed as the most difficult side of that col. The 6th ranked, second hardest climb from Munster, has a higher average grade, but it’s 4.5 kilometers shorter. Up to Wasserbourg it didn’t offer much more than false flats, but upon entering that speck in the woods and especially once leaving it, I quickly ran out of gears on 3 steep kilometers, with an average of 11% and some 15, 16% spikes. This was followed by a short respite to catch my breath, but the final 3 kilometers averaged 8.5% again and I was happy to arrive at the summit, where I was met by Zoncolan-like emptiness. So, no coffee or a bite in a warm shelter, but I did ‘take five’ in the back of the van before I descended towards Sondernach to take on the Platzerwasel. 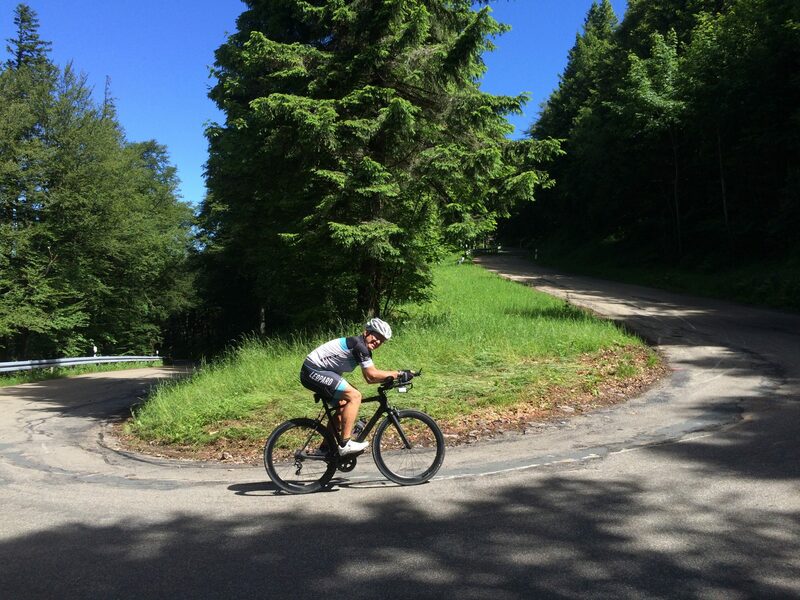 And while I secretly hoped that this would not be a climb similar to the Mortirolo, I quickly discovered that it was in fact not any easier than the Petit Ballon, despite being ranked only 8th in the area. With an average of 7.9% the relatively short distance of 8.2 kilometer may account for that lower rank, but taking out the first easy kilometer, the remaining 7 average 8.5% and 4 of those are 9.1%. Coming from the other side the day before, I already knew that there was nothing at the summit of the Platzerwasel either, but Le Markstein was not too far from here and there at least one restaurant was open. We had a longer break there, also because I was wet and cold – the temperature was around 10 degrees, it was foggy and it drizzled. Unfortunately, it didn’t get any better while we were having our lunch, so the descend towards Kruth was tricky for the best part. Paula remained as close in front of me as possible to guide me with the car (lights) and the Fly6 was flashing at its highest intensity to increase my visibility for traffic coming from behind. I was expecting a descend all the way to Busang after that, but the Col du Page (1.6 kilometers at 8%, max 12%) surprised me on my way there. From Busang to the base of the Ballon d’Alsace in Saint-Maurice-sur-Moselle, it was mainly descends too, so I had at least some time to recover, even though it was raining most of the time. However, it wasn’t raining during most of my ascend, but that didn’t help me much. Ranked 9th, only 9.2 kilometers at an average 6.8%, the Ballon d’Alsace (1,165m) is a fairly ‘even’ climb, with only a few steeper stretches. But the previous efforts in the cold and wet weather had taken its toll and I was nearing the end of my rope. And I was once again met with a foggy and deserted summit, where the restaurant owners had decided it wasn’t worth the trouble of opening up their business, and as it started raining again, I quickly went on to descend to Masevaux for the final of the day, the Col du Schirm / Hundsruck. When I ran into a road block on the D466 after about two kilometers into the descend and I couldn’t plot a way around it, I called it a day and put the bike in the car. Unfortunately, there was a Midsummer music festival in the center, where our apartment was located. As we had a corner apartment on the 3rd floor, we had performances coming in from three sides: under our bedroom window Bob Marley, under the living room window Pink Floyd and around the corner Rammstein. Wednesday brought us clear skies and a blistering sun, with the temperature quickly rising to over 30 degrees Celsius. 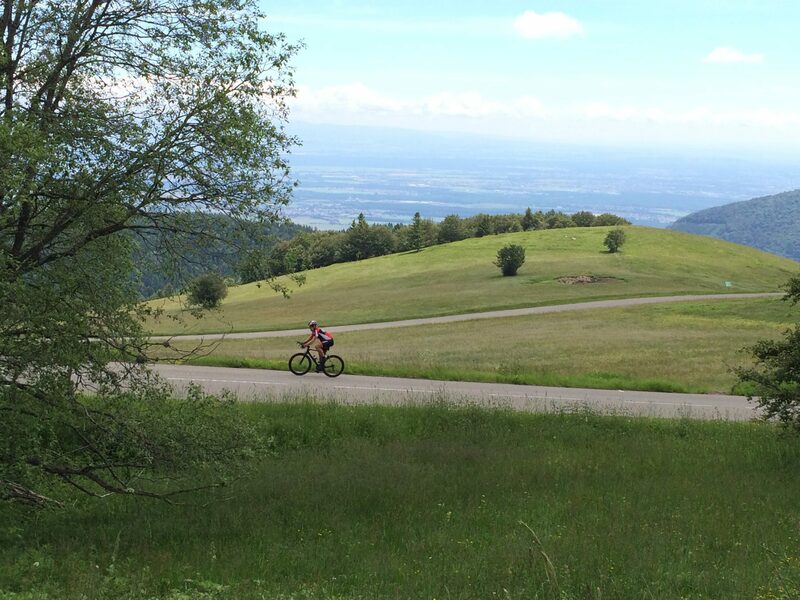 We drove to Waldkirch, north of Freiburg to start the side dish with the climb of the Kandel (1,241m). 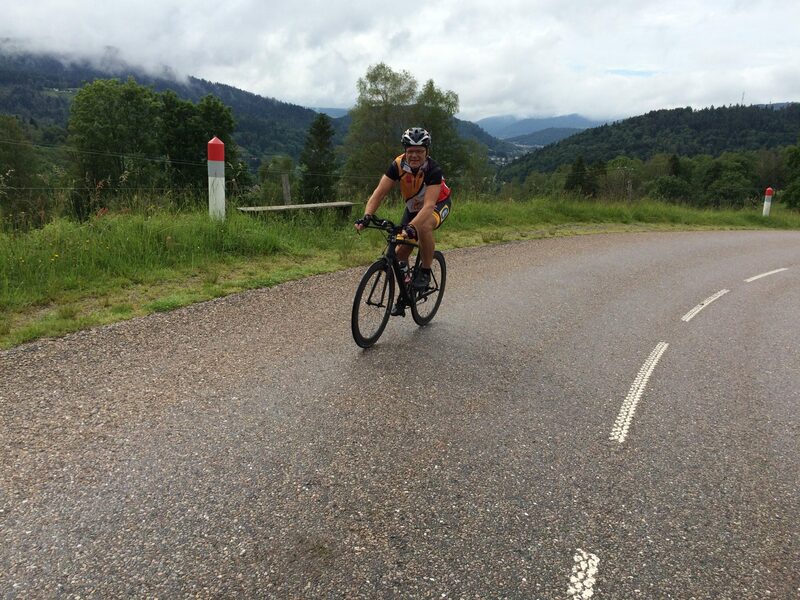 This is rated as the hardest climb in this part of the Black Forest for a reason. With an altimeter gain of 970 meters over 11.8 kilometers (or 920/10.4, not counting the easier exit out of Waldkirch), it averages 8.2% (8.8%) and more 10+ stretches than comfortable. Fortunately, it also offers large tree covered sections, but where I was out in the open, the blistering sun was destroying me just as much as the grades. At least there was a tavern with a view open at the summit and after a short break, I descended towards Sankt Peter and further to Freiburg. Just outside of Freiburg, I had another break and a bite, before turning towards the start of the Schauinsland (1,284m). With its 17.9 kilometers and 927 meters of elevation difference, it looks friendly at 5.1% average, but the actual climb – from Horben – rises 726 meters over 10.8 kilometers (6.7%). And although I didn’t feel that bad, I found out the hard way that I had been unable to adapt to the change in weather when I had to abandon my ascend some three kilometers from the summit. The first 6 or 7 kilometers of little more than false flats went fine, but as soon as the grades started to count again, rising well over 12% at some stretches, I quickly knew I was in big trouble. I had tried to compensate the excessive sweating by drinking as much as I could – which is always a problem during difficult ascends – but obviously I failed and I ended up feeling nauseous, knowing from experience at that stage that severe cramps would strike me soon. I crawled into the back of the van, took the prescribed medication – I have ended up in the hospital after one such episode and while I may not have learned from that, at least I carry the meds with me – and spent an hour getting the genie back in the bottle. Obviously, I knew the trip was over at that point, not just today’s, but also the one I had in mind for Thursday. And to add to the joy, when we finally made it back to the apartment – crawling up the three stairs was a lot of fun – we found that the temperature inside had risen to a healthy 37 degrees as well. So, if I wasn’t already unfit to ride, another near-sleepless night did me in for good. But the next day, despite having trouble walking – or getting in and out of the car – and feeling nauseous most of the day, we did a sightseeing trip that showed a lot more of the beauty of the area and a couple more of the climbs in it. We will be back here in the near future, but I’ll take some more time than effectively three days to cycle the area.